Overcoming social anxiety and shyness is more challenging than most people think. For many people overcoming social anxiety and shyness comes with a lot of anxiety. And anxiety makes overcoming social anxiety very difficult. But why is overcoming social anxiety and shyness so difficult? It’s difficult because people highlight negative experiences and ignore positive ones. The negative experiences receive far more attention than the positive ones. Often, one bad experience is considered to be the rule rather than the exception. Positive experiences, on the other hand, are labelled a coincidence and thus is overcoming social anxiety very difficult. 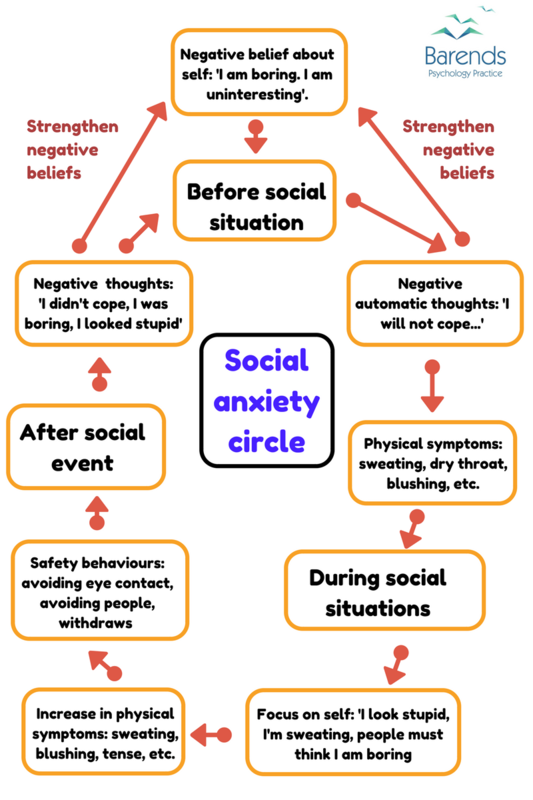 The Social Anxiety Circle image shows how people with social anxiety and shyness are trapped into a vicious circle. Without proper guidelines, overcoming social anxiety is more than just challenging. Therefore, I created a self-help guide for overcoming social anxiety. At Barends Psychology Practice we offer (online) therapy for social anxiety / social phobia. Contact us to schedule a first, free of charge, online session. (Depending on your health insurance, sometimes treatment can be reimbursed). How to regulate anxiety through breathing? Helpful conversation techniques to lower anxiety levels. Switching off imagination for a more realistic view. Changing your lifestyle to reduce anxiety. Knowing when to search for professional help. Which social anxiety causes are there? What kind of social anxiety treatments are there? Step 1: How to regulate anxiety through breathing? Once you’ve practised this at home a few times, you’ll notice that it becomes easier. You don’t have to put your hand on your chest and stomach any more. When you go to a social event, and you notice you’re getting a little nervous, try to calm yourself down with this breathing exercise. You’ll see that it works! Step 2: Helpful conversation techniques to lower anxiety levels. The second step in overcoming social anxiety and shyness is to give you more confidence during conversations. Talking to someone can be very challenging when you don’t know what to say, when there is an awkward silence, or when you’re afraid of saying something silly. So I guess it’s important to give you some tools to avoid these painful moments, and to boost your confidence when it comes to talking to others. In the end, overcoming social anxiety is a lot easier when you have positive experiences. Let the other do the work. When people feel uncomfortable during a conversation they usually make an effort to keep the conversation going. A common way to do this, is to talk a lot, to talk about (sometimes) silly things, or by asking a lot of questions (as if you are interrogating someone). Despite the fact that you’re working hard to keep the conversation going, it doesn’t reduce your anxiety levels. By making the other person work hard you have time to think, remain calm, and enjoy the conversation. You make the other person work by asking open-ended questions. Open-ended questions require more than one word answers. An example is ˝How did you and your best friend meet?˝. For more examples of open-ended questions, click here. The other person has to answer in more details. This gives you the opportunity to formulate a new open-ended question. And so on. Closed-ended questions require only one word answers. This means you have to ask more questions and thus work harder. One word questions. One word questions are great for when you just joined a conversation and want to participate, or when the other person tells you something and you want him to continue talking (without making such an effort yourself). Again, this gives you time to relax, think, and enjoy! How does it work? The moment someone tells you something, you pick one word from his sentence and simply repeat it with a question mark at the end. For instance, if you ask your friend: “How was your day?”. He may answer: “Agh, I’ve had such a busy day, I even had to reschedule some of my appointments“. The underlined words can be used as one word questions. He will explain you more about these words (and from his explanation you pick another word). “Busy day?”. “Yeah, every Friday is extremely busy. Today I had 5 appointments and a meeting. I didn’t even have time to finish my lunch, because my boss needed me again. “Again?”…. and so on. This way you don’t work hard at all, and you don’t need to feel insecure. At the same time you give the other a lot of attention and are strengthening your friendship. On top of that: you are leading the conversation, because your one word questions force the other person to tell something about that word. Personal questions. Open-ended personal questions are very important. They take the conversation to another level, beyond superficiality. Questions like: “How did you two meet?”, ˝What is your favourite childhood memory?˝ invite the other person to talk about something personal, make that person feel ‘important’, and shows that you are interested in him. You can expect the same questions in return, so be prepared. Be aware that some questions are too personal to ask. Some people don’t like to talk about their past, especially, when it wasn’t a pleasant one. Personal information. By telling something about yourself (not too personal), your interests, or weekend activities, you invite the other person to ask some questions about it, or for them to share some personal information too. Step 3: Switching off imagination for a more realistic view. Overcoming social anxiety is difficult when you have the feeling others around you think you are fat, ugly, uninteresting, or blush/stutter often. This feeling can make you feel insecure, ugly, unimportant, and unwanted. Please, realize that these are merely thoughts, your thoughts. The problem with these thoughts is: you will look for evidence to support these thoughts. This means: you’ll misinterpret signs, gestures, and comments. And it will make you feel even worse. Try to challenge these thoughts with or without counseling. Ask yourself the question ˝which proof do I have for these negative thoughts?˝ And tell yourself whenever such a negative thought pops up: ˝I am only thinking …(negative thoughts)…, but I know it’s only a thought. This way you distance yourself from your thought. The following thinking styles make overcoming social anxiety very difficult, so try to identify them in time and eliminate them. Mind reading: assuming that you know what others are thinking (of you). Personalizing: assuming that all eyes are on you, and everything people think, say, or do is negative and has something to do with you. Fortune telling: predicting the future (usually in the most negative way possible). This makes you more anxious before the event takes place. Catastrophizing: imagining that things will go horrible or disastrous when things don’t go according to plan. Shoulds and musts: by thinking ‘I must’ and ‘I should’ you’re putting too much pressure on yourself, and you’ll get (unrealistically) high expectations. Emotional reasoning: because I feel anxious, there must be danger. Or: Because I feel anxious, things must go wrong. Mountains and molehills: exaggerating the risk of danger and negative things, and minimizing positive or realistic odds. Black and white: evaluating yourself in terms of Good and Bad, without allowing yourself to do average or rather good. Post mortem judgement: after a situation/event judging your own performance in stead of describing the situation. People usually focus mainly on the things that went bad or wrong. You’re too focused on your own feelings, thoughts and behaviour. So the best thing you can do is to focus on everything but yourself. Pay attention to the way others are dressed, talk, and behave. Pay attention to what others are drinking, what the place looks like, and so on. Step 4: Facing your fears. Overcoming social anxiety is impossible if you don’t expose yourself to those situations that cause you social anxiety. By avoiding events that make your anxiety levels rise, you never learn how to deal with those situations. Your anxiety will increase over time. And you will avoid even more fun social events in the future. So the best thing to do is to face your fears to make overcoming social anxiety less problematic. The best thing to do is to take small steps to increase the chance of a successful experience and to boost your confidence. So write down a list of situations that are challenging and hard to overcome. Start with the easiest situation and end with the toughest one. Now before you start exposing yourself to these situations, please think of what you want to achieve in that specific situation. Again, don’t make it too hard for yourself, because 1 bad experience may increase your anxiety levels. For some people saying Hi to people on a party is a goal, for others, sitting in front of people on a congress may be very challenging already. Once you’ve achieved your goal reward and praise yourself. You’ve done a great job! I strongly advice to discuss this step with a mental health counselor, because this step is more difficult than you may think. Overcoming social anxiety with the help of a counselor is easier, because a counselor knows the pitfalls. Step 5: Changing your lifestyle to reduce anxiety. Moderate alcohol intake: drinking alcohol reduces your inhibition and makes you feel more relaxed right before you go to an event. But at the same time alcohol increases the chance of getting an anxiety attack. On top of that, tipsy or drunk people often do things they later regret and that may increase social anxiety on the long run. Try to moderate your alcohol consumption. Limit caffeine intake: caffeine intake increase symptoms of social anxiety. You can read more about it at: caffeine and mental disorders. Quit smoking: although you may think that smoking a cigarette calms you down, this ain’t the case. Smoking cigarettes, or cigars, actually increase the symptoms of social anxiety. Quit (soft)drugs: I will not even motivate this. Get enough sleep: it’s tempting to stay awake late when you have to wake up early next morning, but sleep deprived people experience more anxiety. It is clear that overcoming social anxiety while using drugs, alcohol, caffeine or when you are sleep deprived, is very difficult. Step 6: Knowing when to search for professional help. (Online) counseling helps you overcoming social anxiety effectively. The most effective method is Cognitive behavioural therapy (CBT). 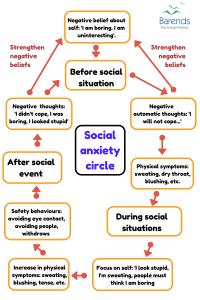 Typically CBT for social anxiety focuses on: learning to control and reduce physical symptoms of social anxiety, learning coping skills, replacing negative thoughts for neutral or positive thoughts and gradual exposure to challenging events. Even though overcoming social anxiety seems to be difficult, it is definitely worth it!